Nicholas Tse’s (謝霆鋒) upcoming travelogue cooking show, Chef Nic <十二道鋒味>, invites his celebrity friends to join him on food adventures around the world. The show premieres on July 12, and will be broadcast every Saturday. 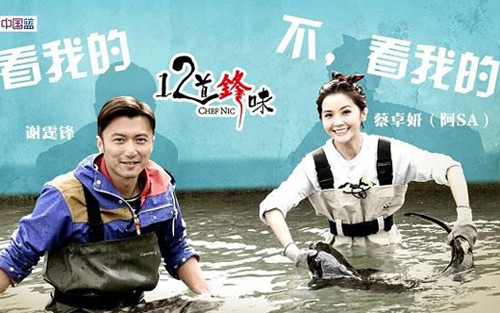 Fellow EEG artiste, Charlene Choi (蔡卓妍), is featured in one episode that takes place in Spain. Nicholas and Charlene share a great friendship and behave like siblings. They have also collaborated in past films such as A Chinese Tall Story <情癫大圣> and New Police Story <新警察故事>. Nicholas has always been very attentive towards Charlene. When he learned that Charlene was upset due to her pet dog’s death, he recommended filming the parts in Spain earlier so he could reassure her. Besides filming for the travelogue, they also visited tourist sites to lighten Charlene’s mood. This article is written by Shirley for JayneStars.com. Super adorable these two together, kind of wished they were dating! Sasa n Nic do look great onscreen and their chemistry is amazing. From the previews, Nic gave Sasa multiple hugs throughout the epi…she is also appearing in another epi w/Wen Zhang n Nic too. The source listed for this article actually links to the Danial Chan article about him becoming a father. Where’s the original source of this news about Nic and Charalene? Seeing the video preview where the huge fish was thrashing around, I would be scared too! And toads just happen to be one of the few things that scare Charlene. Can’t wait for this show to air. Login or Register before you can reply to ..